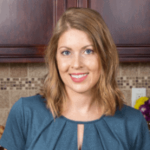 Published: Jun 22, 2017 · Modified: Apr 12, 2019 · By Jen Sobjack · This post may contain affiliate links. 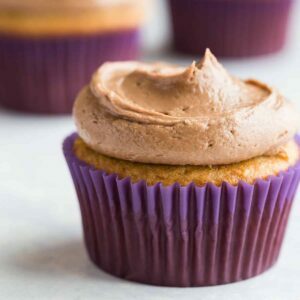 There’s something incredibly addicting about Banana Nutella Cupcakes. Everyone loves banana cake and with this recipe, you’ll get that wonderful banana flavor paired with decadent chocolate hazelnut frosting. 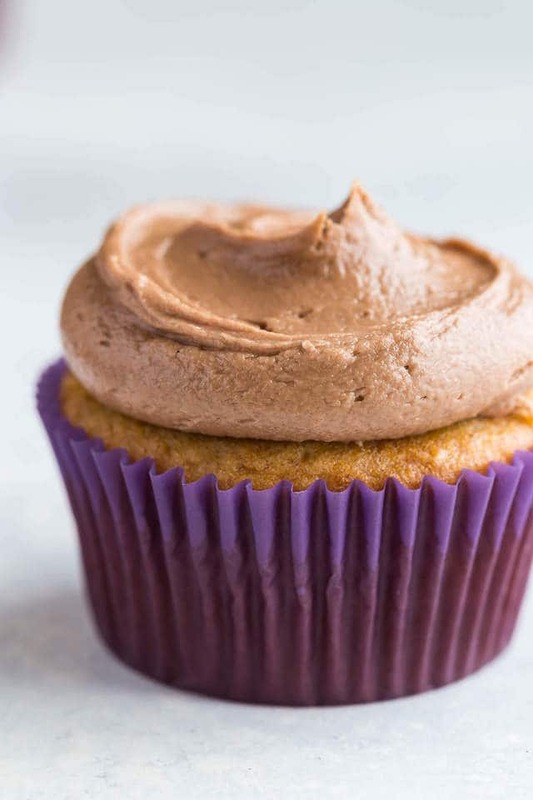 It’s so much better than just plain chocolate frosting and the banana cupcakes are so easy to make, you will want them all the time. I took some time to re-photograph this recipe that is over two years old. My photography has improved greatly over the years and I love to see the evolution of my photos. I make these banana cupcakes all the time and my favorite way to enjoy them is in banana cake. That was up until I recently retested this banana Nutella version. I’m forever converted! The recipe isn’t too fancy. It’s actually very simple and straightforward. I used my trusted banana cupcake recipe and topped it with my new and improved Nutella Frosting. It’s by far the best flavor combination I’ve ever experienced. 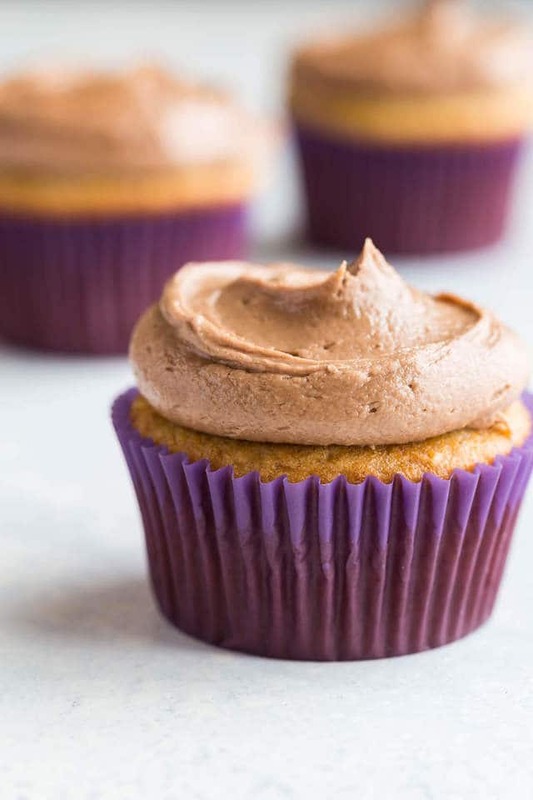 The cupcakes are light, springy, and full of banana flavor. They sort of remind me of banana bread only not as dense. And they always get rave reviews when I make them. The combination of Nutella and banana is quite epic. I’ve seen banana bread with Nutella swirl and it was quite drool-worthy. So, I knew I had to pair the two together in a cupcake. I’m so thankful it turned out as amazing as it did. Slather the frosting over the cupcakes and prepare for an incredible flavor rush. I promise you will love these. Heat butter in a small saucepan over medium heat for 2 to 4 minutes, or until browned. In a large bowl, combine the browned butter, banana, and granulated sugar; beat on medium speed until smooth. Add the eggs one at a time; beat well after each addition. Beat in the vanilla extract. Measure flour by fluffing it with a fork then lightly spoon it into a dry measuring cup, level the top with the back of a knife. Combine the flour, baking powder, baking soda, salt, and cinnamon in a medium bowl; stir with a fork or whisk. Gradually add the flour mixture to the banana mixture alternating with the milk. Begin and end with the flour mixture. Line a 12 cup muffin pan with paper cups. Spoon 1/4 cup of batter into each cup. Bake for 20 to 24 minutes or until the cupcake springs back when touched. Remove from pan immediately and allow the cupcakes to cool completely on a wire rack. In a stand mixer fitted with a paddle attachment or with an electric hand mixer, beat the butter on medium-high speed until smooth. Add the Nutella and salt. Continue to beat until incorporated, about 2 minutes. Add 1 cup of confectioner’s sugar, beat on medium-low speed until most of the sugar is moistened. Add in the remaining sugar and beat on medium-low speed until the sugar is moistened. Turn the speed up to medium-high and beat until light and fluffy, about 2 minutes. Scrape down the sides of the bowl as needed. Frost the cupcakes as desired. The cupcakes and frosting can each be made 1 day in advance before assembling. Cover and refrigerate each overnight. Frost the cupcakes the next day. Frosted cupcakes can be stored in an airtight container in the refrigerator for up to 3 days. Both frosted and unfrosted cupcakes can be stored in an airtight container and frozen for up to 3 months. Thaw in the refrigerator overnight. Ok, I just want a bowl of this frosting! LOVE this icing, but my cupcakes came out overcooked and I only baked for 18 minutes! I think I might add some sour cream next time for moisture. Also stuffed mine after they cooled with Nutella. Yummy. I’m sorry to hear about your mom. But a banana cupcake is sure to make her day and cream cheese frosting would be perfect with these! You get it girl! Bananas and Nutella for the win everrrryday. I’ll take a baker’s dozen, please and thank you! Such a great combo! And Nutella makes everything AMAZING! Totally agree! I could just mash bananas in my Nutella and call it a day. I love the combination of banana and nutella!! They look wonderful! I have had weeks of recipe failure and they are the absolute worst! Just know you are not alone! These cupcakes look amazing! I am drooling!!! Two of my favorites in one cupcake – yum! I’ve definitely had those weeks – hang in there! This would be a hit among the kids i volunteer with. I should use it as bait/ a reason to get them to be good. I seriously want to try them because they look great! These cupcakes look amazing, Jen! Love the banana and Nutella combo – so good! Great cupcakes Jen! They look delicious! And I hate recipe fails, but they seem to happen more and more often to me, especially with baking! Oh, gosh. Nutella and bananas is seriously a match made in heaven! These cupcakes look absolutely insane, Jen! Totally swooning over that thickly-frosted frosting! Aww boo to recipe fails! Those are NO FUN. But it sounds like these were a raging success!! These cupcakes look seriously SO good. I know how delicious they must have been too – banana and nutella is such a classic! I can never turn down a cupcake, especially one that is banana and covered in Nutella! The best combination of flavors! Recipe fails can be such a pain, I totally know how you feel. But these cupcakes look incredible, Jen! I love that nutella frosting too, it sounds delicious. Anything with nutella has my attention! These cupcakes are gorgeous!!! sorry to hear about the almond butter cookies . . but I would take a cupcake over a cookie any day!!! love these and the Nutella frosting?!!! yummmmm!!! Banana & Nutella are so good together!! Actually if you ask me Nutella is good with anything, I can probably eat the entire jar with a spoon! Pinned! Baking disasters are the worst! I totally sympathize. 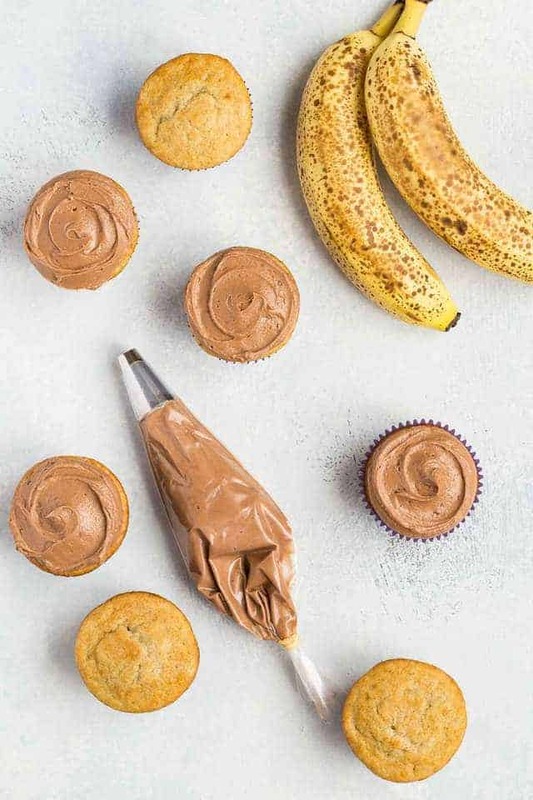 I’m glad you decided to make banana Nutella cupcakes because these need to get in my belly! I LOVE these!! I happen to have bananas on my counter I need to use up. They look great, Jen! PInned! Love the banana nutella combo! These look great! Aaaw sorry to hear that Jen, that was my week last week too. I would have loved a batch of these cupcakes to make everything better. They look amazing! Love the banana and Nutella combo! These cupcakes look amazing, jen! Nutella and bananas go so well together. I’m in love with that pretty frosting on top! Yum! Thank you so much, Gayle! I am now hooked on this combo. Is it bad that I just want to dip my banana into the jar of Nutella this morning?! Girl I definitely know the feeling of a week where nothing goes my way but now I will remember that these cupcakes are the beautiful silver lining. Yep, cupcakes make up for all that has been lost this week!